The Nigerian Senate has launched a probe into reports of a plot to oust Senate president, Bukola Saraki and his deputy, Ike Ekweremadu. PoliticsNGR gathered that some senators are conspiring to remove the Senate president and his deputy as soon as possible. 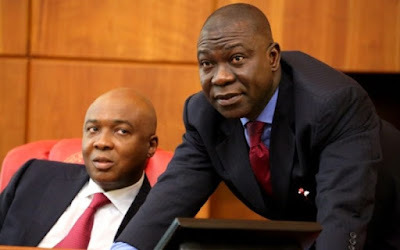 In today’s Plenary session, Senator Obinna Ogba (PDP, Ebonyi-Central) raised the alarm alleging that the group of aggrieved senators were also mobilising civil society and trade groups to protest against Saraki’s leadership. Coming under Order 43 of the senate standing order, Mr. Ogba urged the senate to investigate the matter. Now, I have reliable information that some people are already planning to destabilize the Senate, including the Senate leadership by organising demonstration of which money is already exchanging hands. I believe that all of us are all leaders in this country and everybody who sees something that will destabilize the country or the senate or even the democracy should avoid it. As we are here, if there is any going on, you have the opportunity to raise, not to go outside the chambers to start planning civil resistance; market women to come for demonstration against the leadership of the senate. Mr. President, I want this Senate to investigate this matter properly, I have evidence to show what I’m saying. There is a telephone conversation going on which any other person can also print it out, between senator Abdullahi Adamu and some other people.